You have virtually unlimited choices of where to spend your time, but you always hang out in the same few places. Are you boring? No, you are a human. Studying how people use the space around them, spend their time, and travel, has undergone a revolution in recent years. Today, scientists are able to study the trajectories of millions of mobile phone users to investigate the nature of human mobility. Perhaps surprisingly, research shows that that there are universalities in our behaviour: In other words, although each of us has a unique routine, we all look alike in certain respects. For example, in our new study published in Nature Human Behaviour, we found that all of us spend most of our time visiting just 25 places, on average. Surprisingly, this result is consistent across cultures, ages, and genders, suggesting that this limit is deeply rooted in human nature. If you have heard of 'Dunbar's number", you might be making a mental connection right now. And with good reason. In the 1990s, anthropologist Robin Dunbar proposed that the number of relationships humans can maintain at one time is limited, and this constraint is deeply rooted within the human brain. 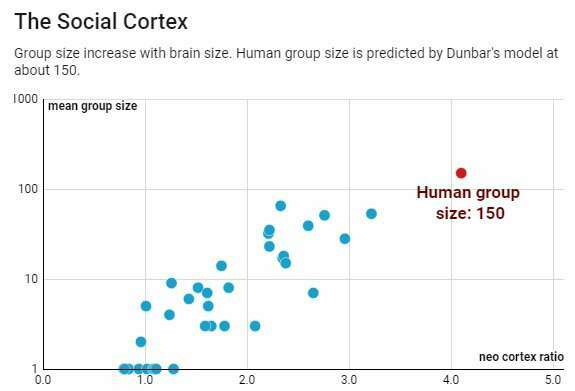 Dunbar observed that, within primates, there is a relationship between the size of a part of the brain called the neo-cortex, and the size of the social group (see the graph above). Given the size of the human neo-cortex, Dunbar estimated that we can maintain around 150 social relationships at any one time. Today, the "Dunbar's number" hypothesis has been confirmed using offline and online data on human interactions. Our new study is the first effort to investigate how humans maintain connections. Not with other humans, but with physical locations: Home and work, bars, restaurants, parks, cinemas, and even bus stops. If you have ever experienced meeting the same people every day while commuting or buying coffee at your favourite café, you may have already guessed that the way humans move around in the world is highly predictable. 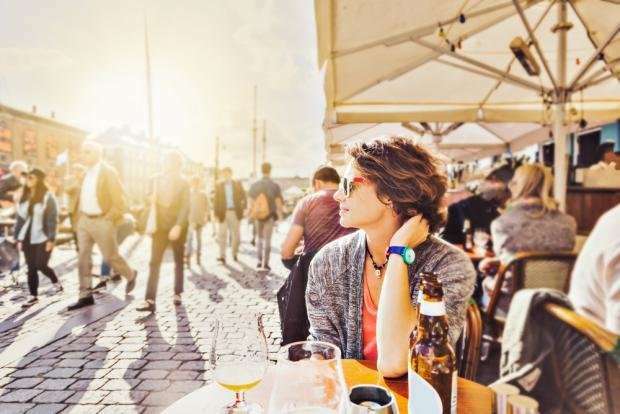 Scientific studies have confirmed this, and shown that predictability can be exploited to forecast future behaviour: Given where you went for lunch in the last few working days, one can make a good guess about your next lunch break. In fact, all of us are equipped with a fairly small set of 'favourite places' where we grab lunch, do sport, relax, meet friends, and develop most of our day-to-day life. Our study is the first to look at human mobility beyond day-to-day routines. We investigated changes in behaviour across months and years, using a unique dataset: A collection of 40,000 high-resolution trajectories (routes) recorded on mobile phones, sampled every minute for 24 months. It includes data from the SensibleDTU project, where students at the Technical University of Denmark were given smartphones to record their whereabouts. Our results suggest that people might not be so boring after all. We actually continuously discover new locations over the course of our lives. Not surprisingly, some of us are more or less explorative than others. But, unexpectedly, any of us, at any stage in life, will find ourselves exploring new places that we haven't been to before. But there is more. Occasionally, we may discover a restaurant we like very much, a new shop with exceptional deals, a nice park a bit further from home, or simply a place where it is worth returning. And we go there. Our small set of 'favourite places' is not immutable, but can accommodate new locations when our preferences change. The data shows this pattern very clearly. Just like when we discover new bars, restaurants and beaches, we sometimes stop visiting places we used to enjoy. And when we started looking at this effect, we discovered something remarkable. Our analyses show that when we accept a new place into our set of 'favourite locations,' we abandon another place. In other words, our day-to-day life develops within a fixed number of places. While these places may change as needs and circumstances evolve, their total number does not. If we make some reasonable assumptions of how we define a 'location,' the actual number of places peaks at around 25, and, surprisingly, it does not vary much between people. Only a few individuals maintain more places than this on the favourites list. Moreover, we also limit the time we spend at each location. For example, there are always about 10 places where we spend less than 30 minutes each week; 4 where we can spend 30 minutes to 1 hour a week, and so on. And we rarely spend more than 48 hours a week in any one place. "I have no time" is not a good excuse. So, we are adventurous enough to add new places to our 'favourites list,' but this comes at the expense of places already on the list. And ultimately, this limits the number of places that we regularly visit. An obvious question is why? Perhaps we are too busy and do not have time to fit in any more places than 25 at any one time? Using a statistical test, we saw that this was not the case: We could in principle fit more locations into our schedule, but we simply do not. The reasons behind this are yet to be clarified, but the article hints at possible explanations. For example, the study also demonstrates that people who visit more locations tend to have more acquaintances, and vice-versa. This relationship is striking and suggests that cognitive limitations may also play a fundamental role in shaping how we use our time and make use of space. There are still many questions yet to answer, but this study is a significant step forward in understanding human mobility and behaviour. We are now billions of people on the planet, and we are constantly moving between places when going to work, shopping, and so on. Wherever we go, we create pollution and chaos. So, the better we understand human movements, the better we can design solutions to make good use of public spaces.